Note: The ability to submit support requests is available on Guide Lite. All the other functionality described in this article is available on Guide Professional and Enterprise only. Help Center, by default, offers the option for end-users to submit requests. If you have Guide Professional or Enterprise, end-users who submit requests can also manage their support requests in the customer portal. The Help Center might not offer the option to submit support requests. It depends on how the Help Center is set up. This section describes the default options for submitting requests and tracking them in the customer portal, without any customization. End-users can submit requests using the support request form (or web form) on your Help Center. 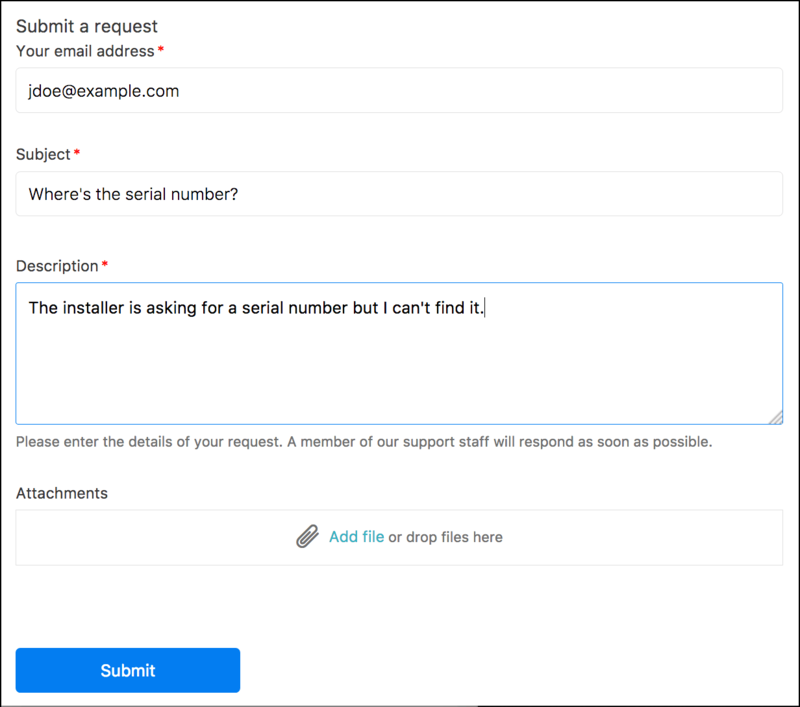 Depending on how your Help Center is set up, users may or may not be required to signed in to submit support requests in Help Center. The support request form might contain more fields than those described in this section. It depends on how the Help Center is set up. You cannot remove any of the default fields on the submit request form. However, you can set up single sign-on, so users will automatically be signed-in to Help Center and will not have to enter their email in the form. See Single sign-on options in Zendesk for more information on SSO. Click Submit a request at the top of the page. If the CC option is enabled for the Help Center and you are signed in, you can add an email address to copy a user on the ticket. To copy multiple users, use a comma to separate each email address. Enter a subject and description of the problem. As you enter a subject, a list of suggested articles in the knowledge base appears. You can click one of the articles instead of submitting the request. Encouraging end-users to look for answers in the knowledge base can deflect tickets. If you belong to multiple organizations, select the organization for this support request. The file size limits are 1 MB for Essential, 7 MB for Team, and 20 MB for Professional and Enterprise. End-users can update an existing support request ticket with a comment by email. Your email must reference an existing ticket ID, using the proper syntax, in plain text. You must have permission to update the ticket, either as the ticket requester, a CC on the ticket, or a member of a shared organization for the ticket. In your email client, create a new email message or forward an existing email. The email is to the support team. The subject can be anything you want. Leave one blank line after the ticket ID. Enter the comment you want to add to the ticket after the blank line. Your email should look something like this. You can update any existing support request that is not closed with a comment. You can also add CCs (if enabled in the Help Center) to an existing support request. And if you belong to multiple organizations, you can also change the organization for a support request when you view it in Help Center. Click your profile icon on the upper-right side of any Help Center page, and then click My activities. By default, the My Activities page displays all requests that you have submitted. Click the link for the request you want to update. Add a comment to update the request. When you add a CC to an existing ticket, you must also add a comment. (Optional) If you belong to multiple organizations, you can change the organization for the support request. You can use the Help Center to track your support requests. If you belong to multiple organizations, you can also change the organization for a support request when you view it in Help Center. By default, the page displays all requests that you have submitted. To filter your requests by status, select a request status from the Status menu. Open is a ticket that's been assigned to an agent who is working to resolve it. Awaiting your reply is a ticket that's been assigned to an agent, but the agent is waiting for more information from you before resolving the ticket. Solved is displayed when work on the ticket is complete. To search your requests, enter a search term in the Search Requests box. You can use ticket property keywords in your search, if you'd like. To see details about a request, click the request title. If you belong to multiple organizations, you can change the organization for a support request when you view details for that request. As an end-user you can be a member of one organization or multiple organizations. If you're a member of a shared organization, you can see tickets for all members of that organization. Note: A shared organization must be set up by an administrator. For more information, see Setting up a shared organization for end-users. Click the Organization Requests link on the My Activities page to see all the requests in your organizations. The link appears only if you're a member of a shared organization. You can add comments to a request if an administrator has set it up. For more information, see Setting up a shared organization for end-users. The link appears only if you're a member of a shared organization in Zendesk. Note: If the Follow button is not available, you might need to ask your administrator to add it to your Help Center theme (see Add Follow/Unfollow for users in a shared organization). You will now receive notifications for new and updated request in your shared organization. You can withdraw a request by marking it as solved. The request must be assigned to an agent before you can mark it as solved. Click your profile icon in the upper-right side of any page, and then click My activities. Click the title of an open request to open it. Select the option on the lower side of the request to mark it as solved. The request must be assigned to an agent. Otherwise, you do not have the option to mark it as solved. Enter any comment you want in the reply and click Add Reply. You can reopen a solved request by creating a follow-up ticket. Click All my requests in the sidebar. Click the title of a solved request to open it. Tip: If you have a long list of requests, filter the view by selecting Solved from the Status menu. Click the link on the lower side of the request to create a follow-up request. Complete the follow-up request and click Submit. Is there a place to find analytics tracking of the number of tickets that are generated via the form on the help center? I have found a location to view the number of tickets created as a result of a search, but we're currently tracking total volume generated via this channel by asocaiting a tag to it, and this tag is accidentally getting associated with other tickets. it should be a way to show the end-user the tickets in "new" status, so they can trace when a ticket is assigned to somebody or not. Thanks for that feedback, Sergio. We've passed your comment along to the documentation team. Thanks for reaching out to regarding this issue. My name's Hervin from Zendesk Customer Advocacy and I'll be assisting you today. First and foremost, the behavior you had described regarding the end-users' experience looking at their tickets is expected. The reason why we have limited statuses showing to our end-users is that we felt that realistically they only needed to know if their ticket has been received and will be worked on or if it has already been solved. If you wish to give your customers more information to work with, that is something you are able to provide with custom ticket fields. I should note this is not information that will be visible from the My Activities page, however they can see that info. if they click on the specific ticket. If you wish to make this visible to your end-users, you may create a custom ticket field in the form of a drop-down field that has the various statuses you wish to convey and make sure that is "visible to end-users". I will make sure to flag this article for our Documentation team so that they will make this behavior more clear for our users. Please let us know if there is anything else we may assist you with, otherwise I hope you have a great day! Super clear, thanks for the detailed explanation. Have a great day you too. Yesterday we went live with Guide and we actively steer users towards using the 'submit a request' form. Unfortunately we are now experiencing major issues with our views & filters, because they filter for certain e-mail addresses on which the ticket was received. I cannot find any e-mail settings in guide, so I have no clue where the 'submit a request' form is actually mailed to. Hence tot able to filter in the views and tickets now showing up in their respective folders. This is causing major issues. Can somebody please advise how to make this work? Zendesk support here, I'd like to get some account specific information to help you with this, so I'll be creating a ticket and reaching out to you via email. Can I connect my contact form with Zendesk?